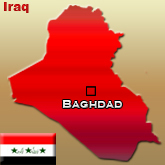 Baghdad - A senior Iraqi Interior Ministry official was wounded when a car bomb struck his convoy as it passed through central Baghdad on Sunday, police said. General Jaafar Taama al-Khafaji and an Iraqi army patrol were passing through central Baghdad's al-Andalus Square on Sunday morning when a car bomb exploded, police told the German Press Agency dpa on Sunday. The general, who is in charge of the Interior Ministry's traffic department, was wounded in the attack, which police called an assassination attempt, but was expected to survive. Sunday's blast followed the assassination of a police general in the southern city of Basra on Saturday. "Unknown gunmen" fatally shot General Hakim Jassim in the Zubair district of Basra, police told dpa Saturday. In a separate incident on Saturday, gunmen killed an off-duty police officer in the northern Iraqi of Mosul, police told Baghdad's Voices of Iraq news agency. Three civilians were also injured in that attack, police said.